Looking for replacement parts or accessories for your Magliner Hand Truck? Check out our many different parts! Scroll down through the various steps, choosing the parts that you need. We offer a great selection of frames, handles, wheels, nose plates, nose extensions (folding noses), frame extensions, accessory bags for your tools, and more. All prices include delivery. 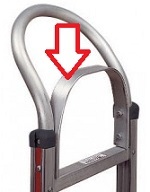 Please make sure that you are getting the correct part and that it is compatible with your hand truck. Unfortunately we will not be able to accept returns on parts. Looking for a complete truck? Check out our Build Your Own Magliner Hand Truck. Straight back* frame with molded cross members. Curved back* frame with molded cross members for transporting barrels and kegs. Two straight and one (bottom) curved back* molded frame. Ideal for transporting cases on tops of kegs. 3 curved molded cross braces with vertical strap. Heavy duty stress resistant frame with straight back. Heavy duty stress resistant frame with straight lattice back and vertical strap. Please note handle #36 is not compatible with frame #5 and #F.
Please note folding noses are not compatible with the following toeplates: E2, G2, K1, K2. Please note: Price includes a set of 2 wheels. Frame extensions are only compatible with handles # 11, 12, 16, 19, 22. Brings the height of the hand truck to 55"for taller loads. Brings the height of the hand truck to 60"for taller loads. Brings the height of the hand truck to 62"for taller loads. Only compatible with frame #1. Perfect part for our used Hand Truck. Fast Delivery and product as expected. Advantages: Purchasing replacement parts is a great way to salvage used equipment. Easy ordering, fast shipping. Can't beat it. Magliner hand trucks are the best and last forever! I have owned my bread route for 15 years and have used the same hand truck. After years of abuse I can find a Magliner replacement part and in just a few days it's just like new. Thanks for a great hand truck Magliner! Great selection of parts, seemed a little expensive at first, but then I realized that it included the shipping. So it was a pretty good deal after all. Was able to get me the replacement part I needed and shipped it quickly. My Magliner lives on! I ordered items one day and the next day realised that I forgot to add something to my order and my phone was giving me problems so Icalled and they helped me get my order corrected without having to use CCard and set me up with Paypal.Order was correct and I received everything in record time.They will always be my Dolly,Carts and equipment place from here on out. Our hand trucks get a lot of use - the replacement nose makes our hand trucks last even longer and work even harder. Love these parts!